it is high time for an update after two years. Some stuff has already been posted on the Facebook page, but there are several new additions as well and believe me, you will find the best two news items at the end of this new entry. 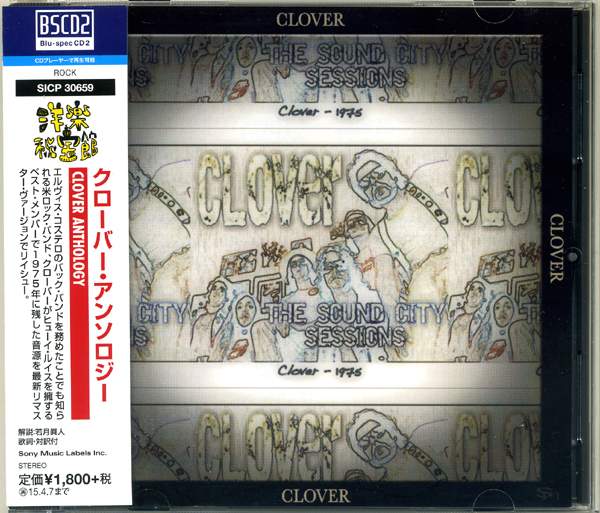 Last year Sony Music Japan released Sonic Past Music's Clover CD "The Sound City Sessions" as "Clover Anthology". Although the title changed, the 16 tracks remain the same. There are no additional tracks to be found but the booklet grew from a foldout to 18 pages - including Japanese liner-notes (outling Clover's history between 1967 and 1978) and English/Japanese lyrics. The cover honestly doesn't look like an improvement on the original cover but Sony manufactured this Blu-spec CD by using a blue laser. The blue laser creates more precise pits, reducing distortion in the optical read-out process, thus the audio quality is better compared to a normal CD. Further information on the album can be found on the 'Albums & Singles" page - just click on the album cover to get there. All Clover fans know that the band left quite a mark in music history because Clover (minus Alex Call and Huey Lewis) were the backing band on Elvis Costello's debut album "My Aim Is True". An album that has already been selected as one of the greatest albums and most impressive debut albums in pop music history. 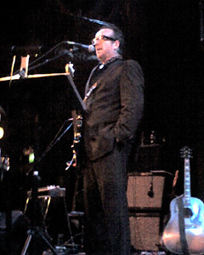 For many years it was not quite clear to the public whom Costello used as backing band, as Clover could not be credited due to contractual reasons at the time of recording. Looking back from today's perspective John McFee, Sean Hopper, Johnny Ciambotti and Mickey Shine were the best choice for Costello. 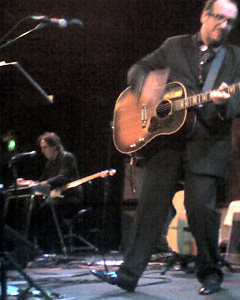 Clover's many years on the road and recording experience paired with Costello's songwriting talent helped to record an outstanding album within twenty four hours studio time. Even though Clover stumbled over the burgeoing new wave/punk movement of the late 1970s with their own music, they still managed to be part of one of its finest hours or 33 minutes to be exact. Due to Costello's fame quite a few books get published and thus Clover often get mentioned in connection to their work on "My Aim Is True". The books by Richard Crouse and Graeme Thomson not only do that, they also include statements by Johnny Ciambotti, John McFee and Alex Call. Richard Crouse's book "elvis is king. 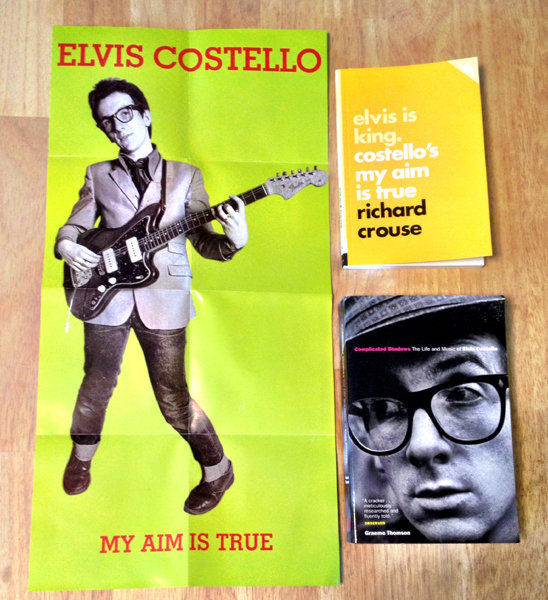 costello's my aim is true" especially examines how Costello recorded his debut album in 1976 and thus also takes a closer look at the recording process in one chapter. We get to know why Costello chose Clover, where and how the recording sessions took place, and how the idea for recording just one single turned into a whole album. Of course Richard Crouse is focusing on Costello's songwriting a lot, but he is also honoring Clover's musical contribution. This book is recommended for all those who just want to focus on Costello's debut album. "Complicated Shadows - The Life and Music of Elvis Costello" by Graeme Thomson covers far more than Richard Crouse's book as it claims to be the definite biography of Elvis Costello. The chapter that deals with the recording of Costello's debut album contains parts of Graeme's interviews with Ciambotti and McFee (often cited by Richard Crouse). Somehow Graeme forgot to mention Alex Call as a Clover member, but this might just be due to his absence on the album - he mentions Huey though. Anyhow, this book is recommended if you want to find out more about Elvis Costello. 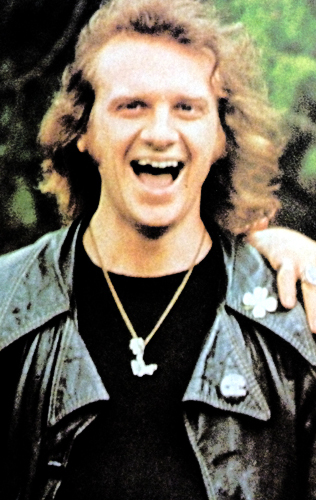 Not only Clover remained uncredited on the sleeve of "My Aim Is True". The same is true for the album cover designer Barney Bubbles. Barney Bubbles (1942-1983), who nowadays is considered to be one of the graphic design geniuses of the late 1970s/early 1980s British indpendent music scene, not only designed album covers for Elvis Costello and Nick Lowe - he also designed the cover for Clover's first UK album "Unavailable". Paul Gorman released the book "Reasons To Be Cheerful - The life and work of Barney Bubbles" in 2010. The book contains hundreds of rare and previously unpublished photographs, working sketches, notebooks and original artwork. On page 92 Gorman also mentions Bubbles work for Clover. Due to the fact that "Unavailable" wasn't a success, Gorman only seems to be willing to devote one paragraph to Clover. 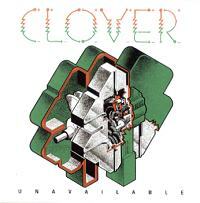 It looks like Gorman didn't research a lot anyhow, as he claims that "Unavailable" was Clover's only album. Gorman rightly says though, that the album's sleeve failed to lift interest in Clover's music, which might explain why there are only small pictures of the front and back cover on page 99. Even though there is only little information on Clover, I would still like to recommend this book to anyone who is interested in cover art. Further information on "Unavailable" can be found on the 'Albums & Singles" page - just click on the picture to get there. 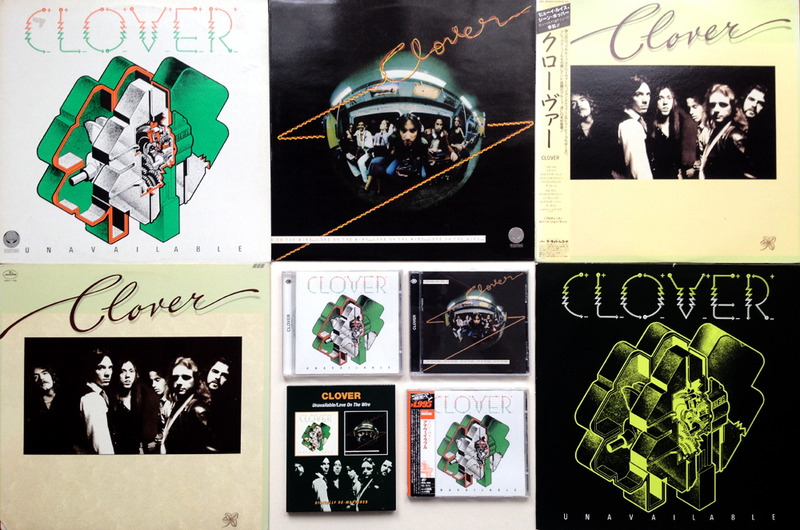 As an avid collector of Clover's albums and singles some questions remain unanswered for many years. One of these questions was always attached to Clover's 1977 Swedish EP which somehow seemed to be out of place in Sweden - especially as the sleeve does not offer many clues and no other Clover records were released in that territory. Turns out that the EP was a bonus (including a Clover sticker) to a split LP by Graham Parker/City Boy. Just because the EP itself often gets offered on eBay without the LP, it looked like an independent release for so long. Never was. Mystery solved! Further information on the EP can be found on the 'Albums & Singles" page - just click on one of the pictures to get there. 1978 ... Dark Star Magazine No. 16 featured a picture with the caption: "Temporary Clover line-up during filming of Levi ad. l-r: Huey, Levi girl, Johnny, McFee, Marcus, Sean, Alex. Foreground: Levi girl." 1986 ... The song "Route 66" (produced by Tony Ashton) was relased on the album "The Best of Clover - An American Band In London". 1996 ... 'Quest of the Grail' began, i.e. since I started the Clover Infopage the #1 question asked has always been: "Where can I find the Levi's commercial?". I really tried to come up with an answer all these years, but although many remembered to have seen the commercial nobody had a copy, including Clover. In 2006 I got in touch with Martin Scott who compiled the Best of album and remembered "... Route 66 was in there for rarity value, 'cos I remembered the TV ad. We didn't have a tape, and I got hold of a quarter inch reel from the Levi's ad agency." This information let me contact Levi's but my request remained unanswered. Once I found out who produced the advertisement I contaced people who had worked for it, but as the company was no longer in business, nobody could help. Very special thanks to Roger for all his help!!! One of the greatest mysteries solved!!! Further information on the Levi's commercial can be found on the new "Route 66 Levi's Commercial" page - just click on the link or picture to get there. Last, but not least stay tuned for "Homestead Redemption" in 2016 ... Clover is rolling again!!! 'Unavailable' and 'Love On The Wire' are unavailable no longer as they have just been re-released on CD by BGO Records. Both CDs have been digitally remastered and can be found in one slipcased CD jewel case. The front of the booklet shows 'Love On The Wire' and the back 'Unavailable' - the latter was released first but might have been put on the back because it does not show the band on the cover. The picture on the left should give you an idea about the CD - which is really nice to look at. The sound quality on BGO's release really improved through digitally remastering and sounds somewhat clearer and richer than Cherry Red's 2003 releases - which is reason alone to buy this CD. It should be mentioned that the CDs only include the original 10 songs per album - songs like 'Chicken Funk' or 'Route 66' which were also recorded for Phonogram/Vertigo Records have not been included. The liner notes written by John Tobler - once a writer for the British quality rock music magazine ZigZag - are more extensive than on Cherry Red's releases but deliver only old news. John Tobler who once even wrote a Clover review basically only spreads quotes/information from other 70s ZigZag magazine articles over the pages of the booklet - which is of course interesting for those who never read those stories. Liner notes written by former members of Clover might have been more interesting though for long time fans. Somehow there seems to be more love in the booklets Cherry Red created or even Real Gone Music who really turned a few stones to come up with an artsy booklet for their 'Clover and Fourty Niner' release. On the other hand, any label that is willing to release Clover's music deserves all the love in the world. after ten years the Cherry Red Records/Lemon CD releases of "Unavailable" and "Love On The Wire" are unavailable again. This is of course a reason to be sad but as you might have already read on the Facebook page both Fantasy albums are made available again now through Real Gone Music on one CD for the first time ever!!! This is great news indeed and once I get my copy of the CD I will of course write a more detailed review. 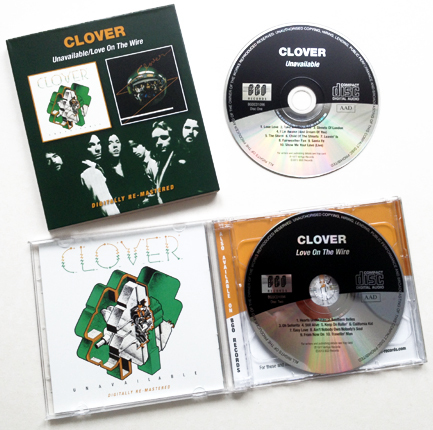 In the meantime please don't hesitate to order the CD and spread the news that Clover is growing again. Special thanks to Real Gone Music and Gordon Anderson for making a dream of many Clover fans come true after so many years!!! First 35 customers to order the CD from us will get a booklet signed by Alex Call! First come first serve. Clover is one of the most famous bands you have never heard of. They were the backing band on Elvis Costello�s My Aim Is True and a later incarnation of the group morphed into Huey Lewis & the News. 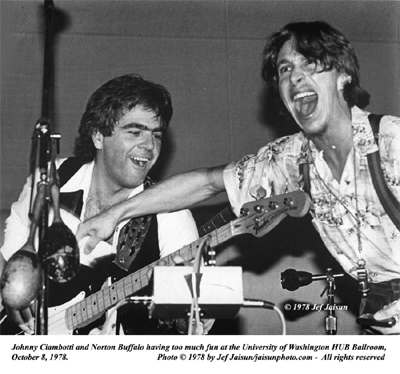 Among the founding members, John McFee became a Doobie Brother, Alex Call wrote hits for Lewis and many other artists (including Tommy Tutone�s �867-5309/Jenny�) and bassist John Ciambotti played on sessions for everybody from John Prine to Lucinda Williams. Given that pedigree, it�s rather astonishing that their first two records, cut for Fantasy in 1970 and 1971, respectively, have NEVER seen a CD reissue. It�s no accident they were on Fantasy, either; not only did Clover hail from the Bay Area (Mill Valley), but they had a rootsy, country-rock sound not unlike their more famous label-mate, Creedence Clearwater Revival. Alex Call himself supplies the liner notes to this overdue reissue, with added photos. this time it is another saddening update as MMicky Shine died in a car accident in Michigan on Sunday morning, Feb 12th. There seems to have been no obvious cause for the accident. MMicky went off the road and into a tree head-on. The police believe he was killed instantly. It looks like there will be at least one memorial service for MMicky ... once I know more I will add the details to the website. MMicky's body will remain in Michigan and the Veteran's Administration is handling the final details. So what can I say after presenting these saddening facts. Of course I am shocked because nobody wants to get messages like this one. Like Alex Call, MMicky has always been in touch with me over the years and it has always been a pleasure to exchange emails with him. MMicky first contacted me December 5th, 1998 when he had aquired a Dell computer and began searching the web ... of course he found the Clover website. In July 1999 MMicky agreed to answer some questions about his life and of course his time with Clover. He really took the time to answer every question in great detail and thus allowed all of us a great insight into his life - including the ups and the downs. I am still grateful to him for being so open. You can find the interview here. It was in New York where MMicky discovered his love for music and already turned into a drummer at the age of 15. Years followed in which he played in several bands, attended music schools etc. His love for music even made him join the army. He had his basic training at the Armed Forces Music School in Virginia and then played in The 328th U.S. Army band. In the middle of the 70s - and I have no clue how he got there - he was living somewhere in the Bay Area and auditioned for Clover. The story on how he got that gig has always been one of the most interesting Clover stories for me. MMicky tells us all about it in the interview of course. Huey and John already mentioned this story in an interview with Dark Star Magazine in 1976 and also how MMicky impressed them. With Clover MMicky also got his name. He was born Michael Schreiner which didn't seem to be a good name for a rock drummer, so with the help of Huey Lewis he changed it into Micky Shine (he added the second "M" a few years later). The name Schreiner (misspelt though) can be found in the writing credits for the Clover song "Bad Is Bad" which Huey Lewis and the News recorded on their album "Sports". It can also be found in the liner notes of the CD "The Sound City Sessions" which features MMicky on a few tracks that were recorded by Clover in 1975 but only released in 2006. In 1977 MMicky recorded/released the album "Unavailable" with Clover and they also backed Twiggy on her album "Please Get My Name Right" and Elvis Costello on his debut album "My Aim Is True". Costello's album probably brought the most fame to the Clover guys (Huey and Alex were not part of that session though). In 2007 Elvis Costello even invited former Clover members to perform songs of that album ... only MMicky didn't get an invitation. MMicky was upset about this of course and told me more than once, especially as Costello publicly announced that he could not find him. MMicky can be assured though that the Clover fans saw what happened ... no matter what EC said. MMicky had to leave Clover when the band started to record their second album in 1977. He explains the cause for his dismissal in great detail in the interview, so I won't touch the topic here. Back in the States MMicky recorded and released albums with Tommy Tutone (Video feat. MMicky) and Burning Rome (Video feat. MMicky) and it looked like his music career would continue. In 1980 though an alcohol and drug problem (overdose) became a turning point in his life and he left the music business. As you can find out in a PBS video and a radio interview below, MMicky started to work for Habitat for Humanity and helped building and renovating homes in the Cheyenne River Sioux Reservation in Eagle Butte, South Dakota for several years. He also found the time to concentrate on expressing his music through art. Please follow the links below and discover how MMicky started his healing through music and art. All of this is quite amazing and I am impressed by the multitude of ideas MMicky had and how much he helped other people by bringing them together through music and art. The world would definitely be a better place if more people followed MMicky's example in one way or another. The thoughts of us the fans go out to MMicky's close friends and family. He will always be missed and remembered. Special thanks to Julianne Bonta, Katherine Brandon, Anna Shee and Ian Evans for their emails! Please check out MMicky's own biography on his website as it lists more of his achievements not mentioned above. Please check out MMicky's entries on his blog "Wordsing". MMicky's Youtoube site features several short films of MMicky's art works. (December 2007) KXJZ's Jeffrey Callison (Sacramento, CA) interviewed MMicky for his radio program 'Insight'. 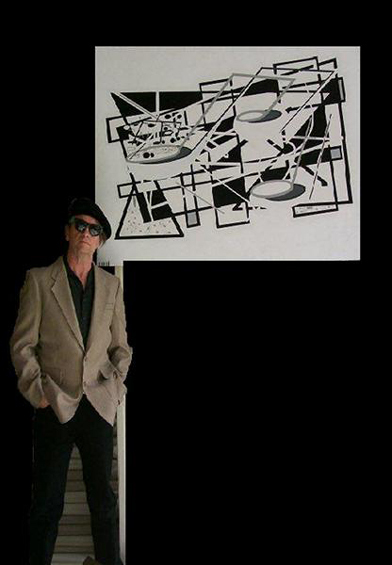 MMicky talks about his art, Clover and Elvis Costello. The interview starts at 35:20. 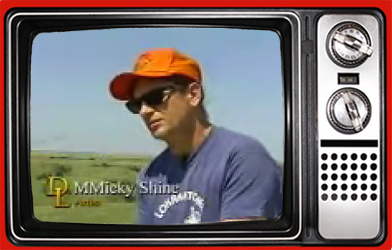 (January 2001) MMicky Shine on the South Dakota Public Broadcasting program Dakota Life. MMicky tells us about his life in the Cheyenne River Sioux Reservation. Please click on the picture to go to the video. (July 1999) MMicky answered a few questions for this website. Please click on the picture below to go the interview. I am sure MMicky would have loved this part of the update now. Another Clover concert appeared on the internet. 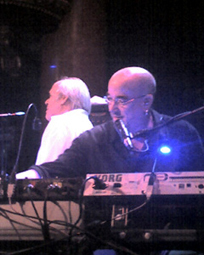 The concert was recorded during Clover's U.S. Tour in 1977. Clover were promoting their debut album 'Unavailable' at that time which Mercury released in the USA (original release by Phonogram in the UK). This recording is awesome in many respects. For the first time we can listen to an amazing MMicky Shine on drums (all other live recordings so far featured other drummers) and it shows that he and Johnny Ciambotti really were a tight rhythm section. We can also hear Clover's original version of "Bad is Bad" for the first time - which Huey would later record with his band The News - and an unbelievable cool version of "La Bamba" with solos by all the band members. You will also notice that Clover already played some of the songs they would later record on their second UK album 'Love On The Wire'. Special thanks to Russ Millenbach for the link! Click on the cover below to listen to the concert. Last but not least, Ray Torrence found a video he mentioned like ten years ago. The video was filmed in late 1973 and broadcast twice in January of 1974 on San Francisco's TV Channel 20 'Happy Hour' program. This video is of course kind of special as not many videos of Clover exist. First of all it is in color but more important Mitch Howie was still with Clover in the early 70s and can be seen in this video. Enjoy the video! Special thanks to Ray Torrence and Matthew Erskine! this update is filled with good news. 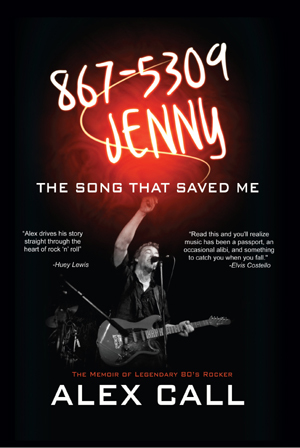 Alex Call has finally released his long anticipated book '867-5309 Jenny - The Song That Saved Me'. Please buy, read and enjoy this book which is available in hardcover or ebook! "Alex has written a vivid and honest memoir. Alex and his Clover colleagues were once almost-mythical figures on record sleeves to me. This book fills in the human story between those photographs and the guys I got to know at the very start of my career and those I am still happy to call my friends. Read this and you'll realize, music has been a passport, an occasional alibi, and something to catch you when you fall." "Alex drives his story straight through the heart of rock 'n' roll"
We all remember that Wolfgang's Vault added a Clover concert recorded December 20, 1975 at the Winterland, San Francisco to their audio archives in 2008. If you haven't listened to that concert online for some time you might be surprised to learn that the whole concert is available on video as well now. Check out the links and enjoy! In April I got an email from Laercio de Queiroz asking me if I would like to own a Brazilian pressing of Clover's self-titled debut released by Disco E Cultura (FLP-35083) in 1970. Of course I said yes and much to my surprise the LP even arrived in almost excellent condition. The LP does not differ from the known releases - except the catalogue number on the cover and some record label information in Portuguese on the LP label. The album even has a museum's registration. I added the information to the discography. Between 1998 and 2010 we have outlived three free guestbook providers. The last provider quit his service from one day to the next and only wanted to hand over the guestbook entries against payment. I found these guestbook archived on the internet somewhere else though and you can now read the last guestbook entries on the Guestbook page again. Because I am tired of all those guestbook providers now, I created a Facebook page and hope that it can serve the same purpose, i.e. strengthen and deepen the social network ties and bonds between old and new Clover fans all around the world. Last but not not least, don't forget to check out the lastest Huey Lewis and the News album 'Soulsville' and the latest Doobie Brother's release 'World Gone Crazy'. this update is one that we certainly don't want to read and certainly one I wish I would not have to write, but life is never really the way we want it to be. Clover's beloved John Ciambotti passed away Wednesday 24, 2010 in Glendale, California. He died from an abdominal aneurysm after surgery for an unspecified condition. I found this rather clinical description in the LA Times today. Although first news of Johnny's way too early departure - being 67 only - reached me via Facebook on Wednesday, it took me a few days for this update. All of this is still surreal to me, especially as I had just made contacts with John in November. He even mentioned that he was a fan of this website. Although we are all mortal, the age of 67 years is way too early to go and I agree with Alex Call that there must be a musical celebration of Ciambotti's life. He has played with so many musicians like Elvis Costello, Nick Lowe, Carlene Carter, Lucinda Williams and his daughter Gia Ciambotti (to mention just a few). Plus, many will also remember Ciambotti for being Dr. John, as he healed people in his chiropractic practice. Subsequently there is a lot to remember and celebrate. As fans and friends our thoughts go out to Johnny's loved ones. He will always be missed and remembered. Huffington Post: Sylvia Sukop writes about John's memorial service. 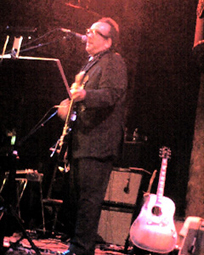 John Ciambotti with Costello and Clover, November 8, 2007. MMicky Shine remembers John Ciambotti. The Ciambotti Tapes - Reel One. The Ciambotti Tapes - Reel Two. The Ciambotti Tapes - Reel Three. Last but not least I also have to mention that Clover suffered another loss at the end of last year. Norton Buffalo passed away October 30th, 2009. He played a couple of times with Clover and being 58 years only, he also left way to early. Norton will also be remembered and you should take a look at his website as there are several projets under way to do just that. San Francisco Chronicle on Norton's early death. Interview with Norton, March 2001. Writing these lines, I remember a photo Jef Jaisun once allowed me to publish on this website. It shows Johnny and Norton in 1978 ... this one certainly leaves me reminiscing now. Hi guys, surprisingly I found a "new" Clover CD in my favorite music store today and decided to update the website after another long period without updates. Sonic Past Music released "The Sound City Sessions - 1975" in Europe on CD now. Hopefully this more than cool album will finally get the kudos it deserves. Please click on the cover for more links/information or buy the CD from Voiceprint in the UK. Alex Call and his wife Lisa Carrie released a CD for the Quint Studer Group entitled "Passion & Purpose". Alex is singing all the lead vocals and has written all 14 songs. The album is kind of a concept album though, as its songs are based on Quint Studer's ideas which are basically about making a difference ... you better go to the accompanying website for further information. You can also listen to the entire album on that website. So far the album received mixed reviews ... but which album doesn't. I like the album very much ... great music, great musicians and even though some songs sound more like Foreigner or U2, Alex's songwriting and voice is brilliant as ever. Next is a cool CD featuring Southern Pacific members John McFee, Stu Cook and the late Keith Knudsen ... but let John give you the details. "... 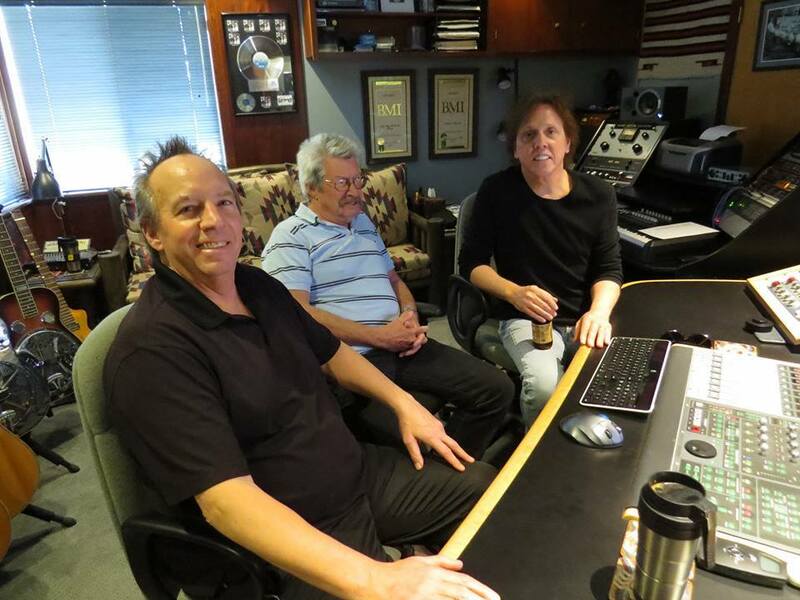 I recorded with Ketih Knudsen and Stu Cook, and is our work as a trio called "Jackdawg". It was material we recorded around the time we were winding down our Southern Pacific work, and is more in the rock vein than what we had been doing as Southern Pacific. We did it purely for the fun of playing some rock music that was to our tastes, although we never got around to doing anything with it as far as making it a public release. When Joey Stec heard about this material, and once he had a chance to listen to some of it, he approached us about re-mixing and re-mastering for a contemporary release, and it is now available as a downloadable release at Sonic Past's web site. It will also soon be available as a physical CD release as well." Okay, that's it for now. Special thanks to John McFee and Alex Call for the info and please forgive me for being so slow with updates. Enjoy the music!!! Hi guys, long time since we've had the last update but this one is quite thrilling. 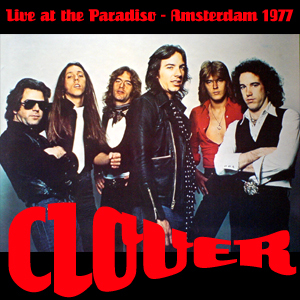 A Clover concert recorded December 20, 1975 at the Winterland, San Francisco has been added to Wolfgangs Vault. Hi guys, here are some photos Cathy Gellis shot. You should also read her blog where she reviews the concert. Special thanks to Cathy!!! In case you haven't seen them yet - here's another link to the photos the SF Chronicle published. You can see Elvis Costello, Pete Thomas and John Ciambotti. Also, here is an earlier show announcement with a comment by John McFee in Mesh Magazine. ... and don't forget to read more about the Richard de Lone Special Housing Project. Anyhow, thanks to Jim for the article and I hope all who can will enjoy the shows tomorrow!!! As I am living in Germany and cannot attend the show (I am currently knocking my head into the wall) I would kindly ask you to send me your reviews of the show for this website or use the guestbook*. Thanks. Special thanks also to John Foyle and Russ Milenbach who informed me about the show today. Last but not least, check out MMicky Shine's MMusic Art Videos ... cool stuff. I like MMicky's art a lot and hope to be able to buy a painting from him one of these days. * The guestbook will soon change to another provider because the current provider will no longer offer his guestbook service. The guestbook entries will not be lost though. Elvis Costello intends to get all of the original Clover members who played on My Aim Is True to be his backing band, i.e. John McFee, Johnny Ciambotti, Sean Hopper and Micky Shine, for one or two concerts at the Great American Music Hall in San Francisco. In addition it seems that this concert will be recorded as well. The show will not include Huey and Alex because both of them did not play on Elvis Costello's debut album. Last but not least, here's a link to ElvisCostelloFans.com that has further info. Thanks to Stephen Shaw for this link. This is all I can tell so far ... please use the guestbook if you have further info. Thanks. Hello, I just want to let you know that Mike's obituary can be found here. 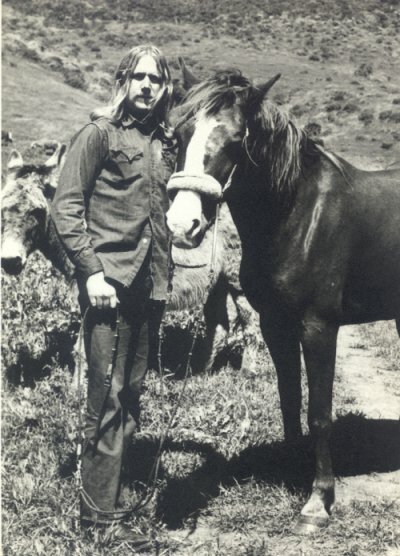 Please notice that all of Mike's old friends should show up at the annual picnic of the Muir Beach Volunteer Fire Department, May 27th, where all the music will be dedicated in Mike's memory. Hi all, we haven't had an update for quite a long time as I was pretty busy during the last few months. Only yesterday I started working on the website again and when I continued this morning I found Alex Call's guestbook entry which results in a very sad update, i.e. Mike Walter passed away. Mike Walter during "Fourty-Niner" cover shoot. 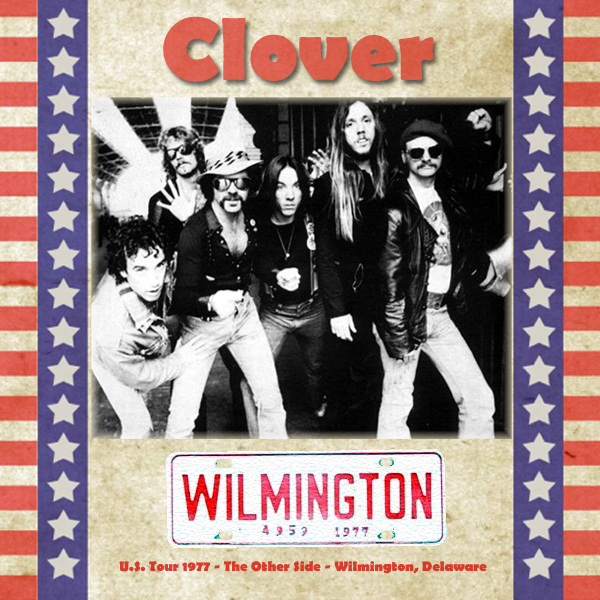 Those of you who are long time fans and friends of Clover will know that Mike Walter was manager, roadie, driver and most of all a friend of the early Clover outfit. In addition Mike has always been a great help with the website as he contributed to it in many ways over the last few years, e.g. with photos (he and his father Frances shot the cover pictures of Clover's second album) and stories (Clover Meets The MC5). Going through Mike's old guestbook entries I have to say I really admire Mike because even though he had health problems he was upbeat all of the time. Mike was giving me props for putting the website together and all I can say is that without his input the website wouldn't be as good as it is today. Yes Mike, you were in the council of elders and I want to thank you for your help in guiding the next generation of Clover fans into the future. I tip my hat to The Ol Roadie ... Rest In Peace Mike and as Alex Call says it in his guestbook entry you will be missed and remembered by all of us. Further updates: Three articles have been added to the Press Archive, i.e. three Phonogram news bulletins. 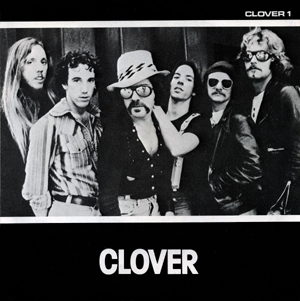 The first one from September 1976 announces Clover's arrival in Britain, the second one from May 1977 announces Clover's first album and the corresponding single. The third news bulletin from November 1977 informs about Clover's second album and an upcoming five months tour of the U.S.A. which never really happened. Some of the information in the latter news bulletin is inaccurate as Huey joined Clover after Sean ... nevertheless the bulletin is an interesting read. Hello, I added "The Sound City Session" tracklist today. Plus, the album is already mentioned by two French websites, a review has not been written yet, though. Hi all, I got news today that Clover's new CD "The Sound City Sessions" will be mailed from tomorrow. So, if you have already ordered your copy be happy. All others should order their copy now. Recently Barry Flast interviewed Marcus David for his Artist Archives. It's fun to listen to the interview and all the music in between ... may it be Clover, Huey Lewis, John Cipollina or Nick Gravenites. Special thanks to Barry and Marcus for doing such a great job. In addition, I added a discography to Marcus' entry under Band Members. Hello again, there have been requests to feature some of Clover's music online ... mmmh, I rather would like you to buy their music and create interest in it again and not just listen to their music for free. Nevertheless, I can understand that people don't want to buy music they have never heard before, thus the front page features some Clover music now, i.e. the Promo-Flexi Vertigo released to promote Unavailable in 1977 and one track from the Paradiso gig. So please listen (and enjoy) and then buy (and enjoy even more), especially Clover's upcoming release "The Sound City Sessions"! Alex Call's "Live at the Paradiso" liner notes. Martin Scott's memories regarding Clover's Best Of album. 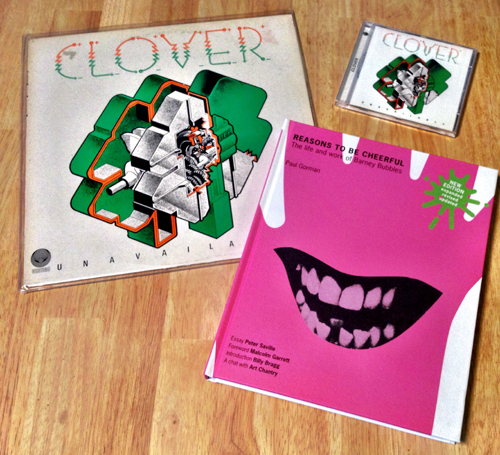 Special thanks to Alex Call for all his help so far and to Martin Scott who compiled Clover's Best Of album in 1986. Hello, here is a small September update, i.e. there is a new Poster scan and ticket scans in the Poster archive (see tour with Thin Lizzy in 1976). Peter Nielsen who is webmaster of Thin Lizzy Guide sent the scans. Special thanks to Peter. Hello again and more good news ahead as this year (probably August) will see the release of yet another Clover CD. Joey Stec's label Sonic Past Music will release a new Clover CD entitled "The Sound City Sessions" with tracks Clover recorded in 1975 - featuring Alex Call, Johnny Ciambotti, John McFee, Huey Lewis, Sean Hopper, Micky Shine and Jeff Pocaro (drums). Because these tracks have never been released before John McFee will do the final remix sometime in July and the CD will be available shortly after ... if that ain't good news I don't know what is. Also, Johnny Ciambotti, Alex Call and Huey Lewis are all involved in this project and Alex Call will (again) write the liner notes. Thanks to Clover and Sonic Past Music. 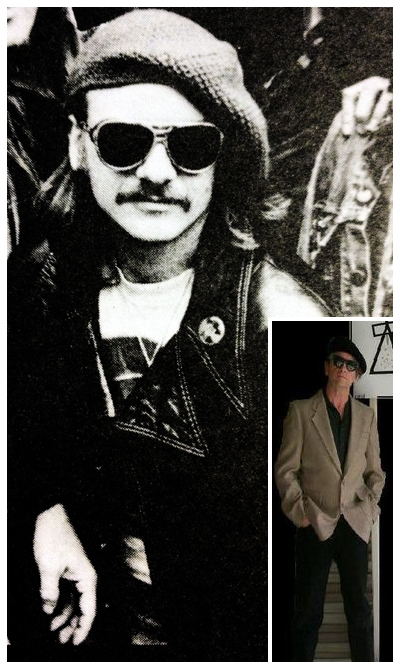 Hi all, Alex Call has been interviewed by a Thin Lizzy/Phil Lynott website. Hopefully Alex's book will be available soon. Phil Lynott and Huey are singing some vocals ... but the sound is too bad. 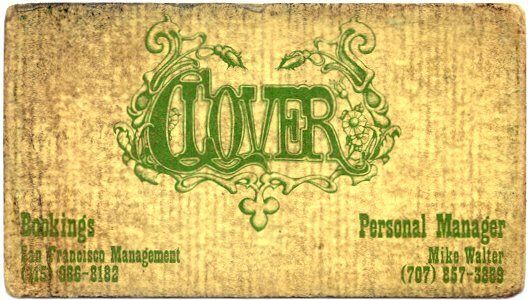 Within the last 10 years that this website exists now, one of the frequently asked questions has always been if any of Clover's concerts has been recorded and if copies are available. My answer so far: Live recordings don't exist or at least I am unaware of them! It really looked like nobody ever bothered to record this band and that only the studio albums are available, i.e. no good times for Clover fans who might even be envious of let's say Grateful Dead fans ... bathing in trillions of live recordings. Finally one Clover concert surfaced at the beginning of this year and the sound quality - being an audience recording - is amazing. The concert was recorded December 20, 1977 by Hans de Vente at the Paradiso in Amsterdam when Clover were on tour with Graham Parker and the Rumour. Hans used his Sony TCS 150, with two separate mikes and recorded the whole concert. Then he stored the tapes at home and only transfered them to CD this year. The concert is a real gem as it features Clover's last concert on the European continent and it is even one of the last Clover concerts as the band disbanded in March of 1978. All of the 11 songs show how tight Clover (= Alex Call, Huey Louis, John McFee, Sean Hopper, Johnny Ciambotti and Kevin Wells) were during that time. Plus, the band didn't get booed like so many times before ... this time they got applause for their concert. It was decided that the concert should be made available to Clover fans worldwide in a decent packing and not just as a MP3 file floating around cyberspace. Alex Call wrote the liner notes and all profits - that result once the production & shipping costs are deducted from the sales price - will be donated to Medecins Sans Frontieres. This CD release is for the fans and not meant to be a profit source. By the way, Medecins Sans Frontieres (Doctors Without Borders) provides medical aid wherever needed around the world. So even if just a couple of CDs are sold the smallest amount gathered can help to pay the medicine/operation someone in let's say Africa needs to survive. I will keep you posted on the amounts gathered. Please click on the cover above if you like to order the CD from the accompanying Sustainable Music website and please leave your comments/reviews in this website's guestbook once you got it. PS: You might have seen MMickey Shine's guestbook entry regarding Ralph Merzlak. I am very sad to hear that Ralph, who has always been one of Clover's biggest fans, passed away so soon. Rest in Peace Ralph!!! So what happend last year? Huey Lewis and Sean Hopper released a live CD/DVD with Huey Lewis and the News celebrating their 25 Anniversary as did John McFee with the Doobie Brothers who can celebrate their 35th Anniversary this year (see www.bay-area-bands.com for further info) - thus we can say that Clover keeps growing. Plus, Alex Call is writing a book about his Rock'n'Roll life entitled "For a good time call:867-5309". Info will soon be featured here and on: 8675309TheBook.com. We all can imagine that Alex has a lot to tell and look forward to his book release. This time you will find two updates, i.e. four new poster scans in the Concert Poster Archive (see years 1970 & 1973) and I added an article from British Classic Rock magazine to the Press Archive (see bottom of that page). Huey talks about his band, Clover, Phil Lynott etc. Hi all, here we go again. Happy New Year and all the best for all of you in 2005. First update in 2005 is an article from the Illinois Entertainer which was written in 1978 when Clover were touring the US. Wonder if Huey has ever fulfilled his "deepest musical fantasy". Read more in the Clover Archives/Press Archive. Then there are two additions to Clover's discography. First is an entry for a Japanese pressing of the "Wade In The Water/Stealin'" single from 1970 with picture sleeve. Thanks to Mike Halpern for the hint. Clover's first UK single "Chicken Funk" was also released in Italy and backed with "Take Another Look" instead of "Show Me Your Love". The cover looks slightly different too. More on the Albums & Singles page. 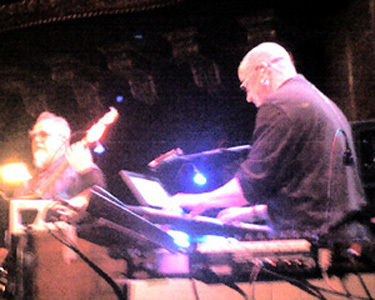 There are some MP3s you can listen to and they feature no other than Dr. John Ciambotti on bass. Other musicians are D. Jennings (vocals), Herman Matthews (drums), Ned Albright (keys), Gregg Leisz (all other string instruments), Engineer and mix: Larry Hirsch. These songs have great lyrics and we can only hope for more. Right now the music is only available on this 'temporary' website. Once the band has overcome some management changes we might see a CD release as well. If you feel like spending some money on music don't forget the latest Clover CD release and my favorite album for this year: Alex Call "Incredibly Thick". If you miss John McFee's guitar licks check out the Doobie Brothers' website. The Doobies will release one of their concerts - "Live at Wolf Trap" - on CD and DVD November 26th. Last but not least, Huey and Sean will be filming a DVD on the occasion of Huey Lewis and the News' 25th Anniversary on December 14 and 15 in Chico, California at the Sierra Nevada Brewing Company. In case you want to be around: for tickets and information you can call the brewery at (530) 345-2739.
exciting news today - it's time to get ready for some love on the wire. Clover's "Love On The Wire" that is, which has just been released on CD for the first time! We all have been waiting for this for a long time and due to the fine people at Cherry Records/Lemon Recordings (especially Ross Landau) the waiting is over now. THANKS! 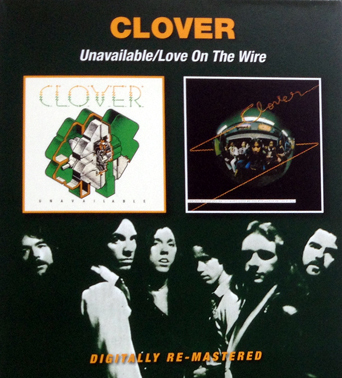 Like "Unavailable" (CD LEM 16), the artwork of "Love On The Wire" (CD LEM 43) has been produced as close as possible to the original artwork - in addition there are bonus sleeve notes that introduce Clover to all those who don't know who Clover were. Plus, the music has been digitally remastered by Universal Music and sounds great. I got my copy of the CD today and I am very thrilled. Not only that Alex Call released an outstanding solo album this year - now both of Clover's UK albums are available too. What a great way to end the year! So let us all enjoy "Unavailable" and "Love On The Wire" on CD and maybe someday someone will release Clover's Fantasy albums on CD as well. The full title of the album is "Incredibly thick songs with complicated chord progressions, vague lyrics and melodies only I can sing." That's an incredibly thick title in itself and a good choice for this masterpiece. 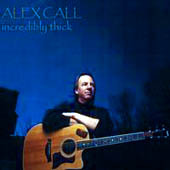 Please visit Alex Call's website and his entry at www.bay-area-bands.com for further information. If you click on the album cover above you can order the album right now from CD Baby - the only place to order the album. As you can see from what I wrote at Bay-Area-Bands.com I like the album very much and honestly believe that Alex has delivered his best work so far. Please support Alex and buy the album. Plus, once you had the chance to listen to the album, it would be nice if you can share your ideas with us using the website's guestbook. Thanks for your support and enjoy Alex' new album - Clover couldn't sound better these days! The second addition can be found within the Press Archive - a biography Arista released in 1983 for Alex Call's first solo album. Last but not least, don't forget to visit Alex Call's new website from time to time. New CD coming, nice pictures and witty remarks! Happy New Year! The website-design has been updated. I thought it was time to get rid of the old background, which has been with the site since it started in 1996 :) Various pages have been rearranged and the navigation should be easier now. There is also a new guestbook because there has been too much advertisement on the old one lately. Two links have been added to the site: Alex Call and MMicky Shine have new websites (see Band Members or Related Links). Both websites are still under construction but whatever Alex and MMicky do should be very interesting. I guess we are all happy to hear/see some new stuff, although Unavailable has been re-released now. So please check out those sites and support Alex and MMicky! Also, Huey Lewis' discography has been updated (see discography or Band Members). What else can be said? 2003 flashback: I met Huey and Sean after their concert in London and had the chance to talk to them for a few minutes. They are really one of the nicest people on this planet and I wish I had had some more time to talk to them but there were many people backstage that day who wanted to talk to them. I also had the chance to talk a little to Nick Lowe that evening and he was surprised that there is a website dedicated to Clover. By the way, Huey knows about this website. For quite some time the page hasn't been updated. Simply because there was nothing new to tell. Today long time Clover fan Steve Aparicio sent me an email which is great news for any Clover fan: Unavailable will be re-released on CD!!! Cherry Red Records, an independent British label will re-release Unavailable (CDLEM 16) on their sublabel Lemon Recordings later this month (links provided underneath). More information coming soon! Special thanks to Steve for this great news and kudos to Cherry Red Records for their brave decision to re-release Unavailable - one of the sweetest lemons ever. Many fans have been waiting for this for years. 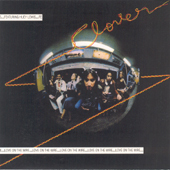 'Clover is growing everywhere' - this was one of the slogans Phonogram used to promote Clover's music. Especially for 'Love On The Wire' they placed some advertisements which where quite funny and show that Phonogram did a better job than Fantasy ever did. Another of this advertisements can now be found on the Concert Page (Graham Parker tour entry). Instead of just displaying the black and white advertisement I coloured it and hope you like it - enjoy. Second update can be found on the Albums & Singles page - as I found yet another single. "Hearts Under Fire" b/w "Still Alive" has also been released in the U.S. as a single and not - like I thought till now - only as a DJ promo. Compared with the Dutch single release there is no picture sleeve though. This update brings two new (I know: old) articles to the 'Press Archive'. One is from Nuggets Magazine and is basically an interview with Alex Call. Catching Clover on tour 1976 during their first few weeks in England. It is interesting to read the information regarding the tour with Thin Lizzy, demos ('Bad Is Bad') etc. The other article comes from Sounds Magazine. This time it's Huey and Johnny's turn to talk about the bands past, present and future. Egyptian chants? On Friday 17, 2003 Bob McFee passed away at the age of 54 years. Bob was born October 6, 1948 in Santa Cruz, California. He is known for his work with The Tiny Hearing Aid Company, The Flying Circus and Norton Buffalo. Bob is survived by his wife Michelle, his son Brian and his brothers John and Don McFee. Bob will be missed by his family and friends. Happy New Year! Here we go again with another website update. There are three major changes this time. First of all there are three new articles within the Press Archive. One is a short Clover biography Phonogram published when Mercury released the album 'Clover' in the U.S. - thanks to Matthew Erskine. Then there are two articles from the San Francisco Chronicle (1972 and 1977) - these come from Ray Torrence. 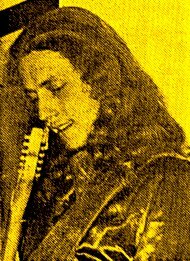 Ray Torrence has been the manager of The Mother Pluckers, a band who sometimes opened for Clover in the seventies. He also shares some concert posters and handbills with us - subsequently the second update can be found on the Concert Page. I added some other stuff and there are more than a dozen new scans to be found now. Special thanks to Ray!!! The third update can be found on the Albums & Singles page. There are several small updates/additions and all the entries for Clover's singles have been rearranged. Although it alway looks like there is not enough stuff to keep this site running - I always find something for the next update. Three changes to be found this time. First of all you will find a 'new' article in the Press Archive from BAM Magazine, August 1977. Although the writer at times is getting away from what was really happening in England, it's an interesting article to read. In addition I also updated those Ciambotti interview articles (The Ciambotti Tapes - Reel 1, 2, and 3) from Dark Star magazine with some graphics. Second update can be found on the Concert Page. Lynyrd Skynyrd/Clover tour dates can be found now - some new pictures aswell. I also colorized the Clover/Graham Parker advertisement. The original ad is only black and white, which you might remember. So, don't expect to find this ad somewhere. I colorized other pictures aswell - just because it looks better. Talking about pictures - that's the last update: The Picture Archive has been updated. Two or three new pictures and a slide show can be found. The performance of the slide show depends on the speed of your internet connection. Once you looked at all the pictures (when the pics are in your computer's cache) it should work okay. Hello - this time no update on the web site but a call for help. Francis Rocco Prestia Tower of Power's bass player is very very ill and urgently needs a liver transplant. Please visit the link underneath and inform yourself. Maybe you can help too - every dollar counts! There are some changes on the Bay Area Bands page. Just take a look - I hope you like it. Thanks to all who have been involved, especially Mike Somavilla. Anyhow the site had to move because what started 1996 with just one page has grown pretty much - which is striking too - for a band who's music is still soo unavailable. Just shows that true fans never forget. Then there is some facelifting on the site but as mentioned before basically everything stays pretty much the same. New additons include an article/chapter on Clover from a biography on Huey Lewis by Robert Drapper. The article can be found in the 'Press Archive' and reads actually very nice. Only problem is that Unavailable was released first, Love On The Wire second which shows that Drapper didn't get the facts right and subsequently his argument for Huey's musical development looses clarity. Despite this blunder the article is worth reading. In addition some of the articles in the 'Press Archive' have been updated with more pictures. Last update can be found on the 'Band Members' page. Discographies for Huey Lewis and Sean Hopper have been added. Showing their recording history sofar. Discographies for the other Clover guys will follow. Hope all of you had a good start into 2002 - many things happened last year - let 2002 be a better year - one which we can all enjoy. So, what kind of an update can be found this time? Well, there is always something. Martin Stassen, who is a big Phil Lynott/Thin Lizzy fan came up with some 1976 Clover/Thin Lizzy tour info. Plus he sent an article on Clover from the tour programme of the same tour. The tour info - tour dates and a clipping from Melody Maker Magazine - can be found on the 'Concert Page' and the article, which has some great photos taken by Adrian Boot, in the 'Press Archive'. Special thanks to Martin Stassen! Another addition on the 'Concert Page' is a scan from a 1977 Lynyrd Skynyrd tour programme. Clover joined them on their British tour. A few links have been added to the 'Related Links' page. One takes you to the Bluebird Cafe - the site has an Webcast Archive with a recent appearance by Alex Call. So tune in and enjoy!!! Long time I have been looking for the article which can be found in the 'Press Archive' now. It was released in Mill Valley's Hard Road Magazine June 1970. Special thanks goes to Joel Stein who took the time to scan the entire magazine and sent it via email - page by page - for use on this site. The article gives us another chance to read about the early Clover and - very rare - get in touch with the Flying Circus. A second update can be found on the 'Bay Area Bands' page. I am very happy to present info on another band long forgotten. Logos had been playing alongside Clover and Sound Hole for many years. Special thanks to Bernie Chiaravalle who took the time to sum up Logos' history for us. There are also two other new entries - one for the Flying Circus and the other for the Hereford Heart Stringers, a band Sean Hopper belonged to before he joined Clover. Thanks goes to Ann Pierson for the Hereford Heart Stringers' info. An article on Clover and Huey Lewis has been added to the 'Press Archive'. It has been released first 1999 in Newsline II, which is the club newsletter for the very recommendable fan club of Huey Lewis and the News. Being a member of Newsline II myself, I enjoyed reading this article from the beginning and as not all the readers of this website are members of Newsline II :) I thought it would be a nice idea to give it a second release on this pages. So I asked Debbie Parry, who is President of Newsline II, if I could use the article. She in turn asked Ralph Merzlak who wrote the article and here we go. Ralph Merzlak is a photographer who has been a long time friend to Clover and Huey Lewis and it is a pleasure to finaly have his article on this pages. Some of his pictures can already be found in the 'Picture Archive'. I always try to give credit to the photographers and Ralph might forgive me that his name hasn't been added yet - but most pictures being sent to me don't include the photographer's name. Special thanks goes to Ralph and Debbie! Do I have to say more? Yes, Huey Lewis and the News' new album Plan B is a killer and everybody should get a copy. Any other album I can recommend right now? Yes - check out ex-Clover drummer Marcus David's band 'Pat Hall and the Fat Guys Band' - their new album 'Heart Of The Blues' is very enjoyable too. Link can be found on the 'Related Links' page. That's all for now! The first pictures were taken late 1973, early 1974 at the Scoreboard in San Rafael. The others were taken at the Levi ad filming in London September 1977. Marcus tells: "The Levi ad was a commercial that ran before movies at the cinema. It featured 2 "hot model babes" in poured-on levis hitch-hiking across America along rt.66. They end up at a club where Clover is playing. The song "Route 66" is the soundtrack. I never saw it. It started running the week after we left London in late '77. It was never released in the U.S."
Special thanks goes to Marcus for the pictures and the Levi ad story. He might give us more details on his work with Clover in the future. As he has been a drummer with Clover - a fact not known by many - I changed his entry on the 'Band Members' page - something I should have done long time before. Plus, you will find a link to Marcus' new band. Finally - many will have seen it already - I added a 'home-made' promo for the upcoming new album 'Plan B' by Huey Lewis and the News. You will find a link to the HLN Today web site and I hope that - the albums' release date being July 24th - you will find only good news on that site. Best of luck to the old Clovers Huey and Sean and the rest of the News!!! This time a few changes on the 'Albums & Singles' page were made. You will find bigger and better cover scans and a few additions here and there. One new addition is a cover scan and info on the Japanese release of 'Unavailable' ... well ... I should say 'Clover' because it has the U.S. title and cover artwork plus OBI strip. I also added the Japanese liner notes. Although I don't have the slightest idea what they write - I do think that one can at least say that this Japanese release was not published 1977 but sometime later. I also added a new entry for another Clover single. You will find a cover scan of a Dutch single for 'Hearts Under Fire/Still Alive' from 1977. The copy I have has a promo stamp and I do think this single is very rare. You should take a closer look at the cover - one can only see five band members. We all know that Micky left Clover when 'Love On The Wire' was recorded. It is interesting to see that they didn't add the session drummer Braunagel or even Kevin Wells. On the 'Band Members' page you can find a link to the 'Toluca Lake Chiropractic' where Dr. John Ciambotti is working. As I start writing these lines I just realize that we have Friday 13th - hmmm - well I'm not superstitious. Anyhow, this time quite a few things have been added to the page. Last time I promised more stuff comming from Mike Walter. 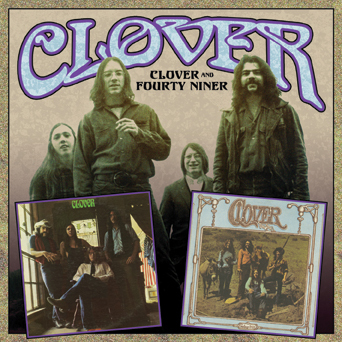 Mike worked for Clover from 1968 to 1972 and he is the guy who took the pictures for the 49er album cover.You can find another poster scan he sent on the 'Concert Page' (poster artist has been Kevin Haapala who also did the cover for Clover's 49er album). Mike also shares a story with us - the way he remembers it - on how Clover met the MC5. The story can be found under the MC5/Clover poster on the same page. Thanks Mike! In addition Mike sent a few pictures which show John and Huey - these can be found within the 'Picture Archive', together with another picture from 1983 showing Huey, Sean, Alex and John. Small additions can be found on the 'Other Appearances' page - Carlene Carter explains how she got in touch with Clover's music and two more cover scans were added. Last, but not least there has been a big update on the 'Bay Area Bands' page. Almost all entries were updated. Not only did I add lots of pictures - newspaper/magazine articles were added to the entries for Soundhole, SVT and Terry and the Pirates. Also, being a big John Cipollina fan, I added an article on Quicksilver Messenger Service to the John and Mario Cipollina entry. The original article was written sometime at the beginning of the 90s - subsequently the discography was out-dated. I dared to update it. I would like to thank all those people who sent me material which did help to update the 'Bay Area Bands' page, especially Tim Timmermans and Art Siegel. I think that's all updates - except, a few more links have been added to the 'Related Links' page. You should take a look at Greg Douglass' web site. Not only did he play with Soundhole, Terry and the Pirates ... He is also one of the best Bay Area guitarists. Recently he released a new solo album - cover art by Kevin Haapala. That's all for now - Happy Easter! Three updates added this time - first to mention is an interview that I did with Norton Buffalo. Norton tells us about his time with Clover. I am very grateful that Norton took the time to answer a few questions. 'Interview Archive' is the place to go. More pictures have been added to the 'Concert (Poster) Page'. I want to thank especially Mike Walter who scanned two of the new posters to be found on top of that page. More from/about Mike with the next page update. Thanks Mike! Thirdly, another entry and cover scans have been added to the 'Other Appearances' page. Unbelievable, another page update and it didn't take me a year to do so. Yeah, things keep getting better! First of all Russell Lloyd sent me some more pictures he took in 1974. That's Clover live! The pictures can be found on the 'Picture Archive' page. Thanks goes to Russell. In additon you can find two promo shots of Clover which I also added to the page. Matthew Erskine sent me information about an early Clover single I have never heard of before and he also told me about a 8 track stereo tape cartridge for Clover's first album. More can be found on the 'Albums & Singles' page - including new cover scans. Thanks goes to Matthew. Recently I found an internet site which offers a signed limited edition reprint of the MC5 - Congress Of Wonders - Clover concert poster from 1969 by Gary Grimshaw. I ordered this poster and I can tell you it's worth every dime. The colors are unbelievable. For some time I tried to get the original first print of this poster but when I saw that the price is something between 300 and 600 Dollar ... well,the reprint came just in time. If you are interested just go to the 'Concert Page' - I added some links that will give you more detail. Oh, you can also find a Huey Lewis and the News concert poster - also signed by Gary Grimshaw! I bought this one too. Being a first print it might be worth ??? Dollar in a few years. Here we go 2001. This time you will find major changes on three pages. First of all I have made a few changes on the 'Band Members' page. I always felt that something was missing. Hopefully this feeling will go away now. Take a look! The same is true for the 'Other Appearances' page. Take a look! Last but not least, I added some new pictures to the 'Concert Page' and rearanged parts of the site. Yeah, I like it - take another look! Well, and if you are not tired of looking around you can follow some new links on the 'Related Links' page. This time I added a few more scans to the 'Concert Page' - I really like these old posters, there is so much history in them. I hope you get an idea of how the real posters/flyer look. Here is another great addition to the page. Just a few weeks ago I got in touch with MMicky Shine (well to be honest, he got in touch with me). I sent him a few questions and MMicky took the time to answer them all in great detail (to say the least! )There are even some things he says for the first time and that's why his answers are so interesting, funny ... touching. Please read and enjoy. Plus, if you get the chance to support MMicky - do it (just take a look at his web page). So don't waste any time on this page - Interview Archive, that's where you find the MMicky Shine Interview. Wait, one more addition can be found. MMicky also sent me a picture that shows Clover and Phil Lynott. I added it to the Concert Page. Special thanks to MMicky Shine!!! Russell Lloyd sent me two pictures - one of a concert poster(Michael Bloomfield/Clover/Flying Circus) and a photo from Winterland 12/10/1974. I added these to the 'Concert Page' and the 'Picture Archive'. Please take a look and enjoy. Maybe we will see more of Russell's pics soon. Special thanks goes to Russell! Last, but not least you will find three new links on the 'Related Links' page. One connects you with Micky Shine's own web page and the other two links to his art! All of the tracks which we can hear on the CD I discovered recently are studio tracks. 'Twelve Ducks' and 'Milk Of Human Kindness' have never found their release on one of Clover's albums. Nevertheless, like 'No Vacancy' (different recording than on 'Clover') these are very strong tunes. The liner notes don't mention when the recordings were made, but they stress that Huey Lewis belonged to Clover and on the back-side of the CD one can read 'CLOVER featuring Huey Lewis'. Well, it's Clover whom we can hear on these wonderfull recordings but without Huey or even Sean. It's the early Clover outfit - Alex, John, Mitch and Johnny. Thus, the recordings must have been made in the early seventies. By the way, the album title as written on the cover is 'San Fransisco Nights' and not 'San Francisco Nights'. The moment you don't think about it, things happen. Well, I did not think that any of Clover's music would find a release on CD soon. Hey, and now three tracks are available on a sampler called 'San Francisco Nights'. Two of them are non-album tracks and I can't wait to hear them. I will add more information about this album to the page soon. In the meantime you should try to get the album yourself. Just search for 'San Francisco Nights'. Here we go again. Actually I don't want to talk about it, but I really had some computer problems lately which resulted in a longer offline-time. Terrible! First thing to mention this year is that you can buy 'A Simple Life' now. Chris Michie has a few more copies of this rare second solo album by Alex Call. So, if you still don't have your copy - be quick! By the way, also check out Chris' music - very enjoyable! Further details can be found on the 'Bay Area Bands' page. Last but not least, I did add a few comments Hillel Resner sent me to the Cream Puff War article (see 'Press Archive'). Thanks goes to Hillel for his addition because it shows us that a) one should never believe all that has been written down and b) one never knows what really happened, because the truth is hard to catch. This time special thanks goes to Colin Hill. He sent me copies of handbills and flyers from Clover's early days. I added these to the 'Concert Page'. Take a look and enjoy! Finally, the last part of the Ciambotti interview (Dark Star Magazine No.16). 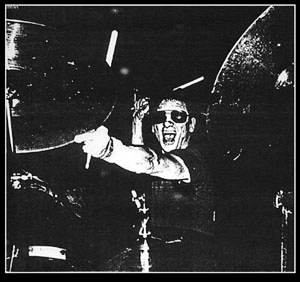 The first part of an interview with Johnny Ciambotti has been added´to the Press Archive (Dark Star Magazine No.14). The rest will follow soon. The entry for 'Unavailable' on the Albums/Singles page has been updated. I added an old article from Dark Star Magazine to the Press Archive, which is basically an interview with John, Huey and Johnny - very interesting. Also, an entry for another Spanish single can be found on the Albums/Singles page. Taxim Records released a wonderful 5-Track-CD by Alex Call. More information can be found on the Bay Area Bands page and on Taxim's web site. I finally got a copy of Fantasy's release The Clover Chronicle - I added the cover pic, plus liner notes, to the Albums/Singles page. You will also find another picture on that page - enjoy! A link to Jef Jaisun's photography web page has been added to the picture page. A picture of Johnny Ciambotti and Norton Buffalo can be found on Jef's page. 'Chain Gang' and 'Route 66' were added to the lyrics page. Great job Steve, thanks. All lyrics to Clover's albums are now available. Special thanks to Steve Cafarelli who transcribed the lyrics. More pictures have been added to the page - special thanks to Karen Chandler. The pictures she send are a great addition. Especially the picture on the main page. Press material has been added to the page - some interesting ZigZag articles and an article on John Ciambotti's old band The Outfit. Special thanks goes to Michelle McFee for the latter. Last but not least, I added a guest book which I hope some people will sign. I didn't change the overall style of the page, although I did fool around with frames for some time, but who needs frames at all. Anyway, I still hope that this page gives insight into the story of one of the most under-rated bands on this planet.